HandKrafted by Stephanie: Verve Release Tonight! Are you ready? Tonight is the big Verve release in the SCS forum here from 8-10 PM EST. Be sure to stop by and see all the new sets! You don't want to miss this! Sets are on sale right after the release! 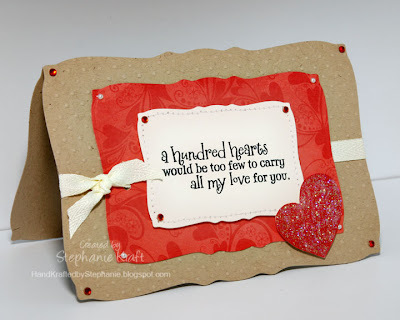 Here's a simple one using one of the sweet sentiments from Hundred Hearts. Accessories: Curved Rectangles (Nestabilities), swiss dots embossing folder, Cuttlebug (Provo Craft), slot punch (SU! ), pearls, rhinestones (Kaiser), ribbon, Star Dust stickles (Ranger), foam boosters, thread, sewing machine. I love, love, love this card! This simple layout with the glittery heart is just too darling!